For my 70th birthday gift, my children and grandchildren gave me enough money to buy an iPhone. They wanted me to join the 21st century, they said. Since then, I have become obsessed with Angry Birds, the first game I downloaded. My practicing Buddhist daughter says the game makes her sad because she loves birds and feels terrible if they fly into windows. In this game, they explode into cluster bombs, the better to kill the pigs. When I first downloaded this APP, I had no idea how to play it. It did not come with instructions. Josh, my eleven-year-old grandson, explained the premise: something to do with pigs stealing birds’ eggs. The birds retaliate—another feature of the game the Buddhist finds depressing. Kaari, the six-year-old daughter of the Buddhist, eagerly showed me how to slingshot the birds and increase their destructive effect. What has this to do with the topic of these posts? Enjoying works of art does not come with instructions either. In fact, if you try to find assistance in understanding the art in paintings, you will mostly find information about the subject of the picture, or its history, or information about the artist’s life, or whether the artist’s work is “relevant,” as the current debate over “Cézanne’s Card Players” reveals. “Cézanne’s Card Players” opened at London’s Courtauld Institute last year and moved to the Metropolitan Museum of Art in New York where I saw it in the fall. It focused on three major works of the same subject—men playing cards and smoking pipes—and included several smaller lead-up works and pencil sketches along with a full-size black and white reproduction of The Card Players in the Barnes Foundation. 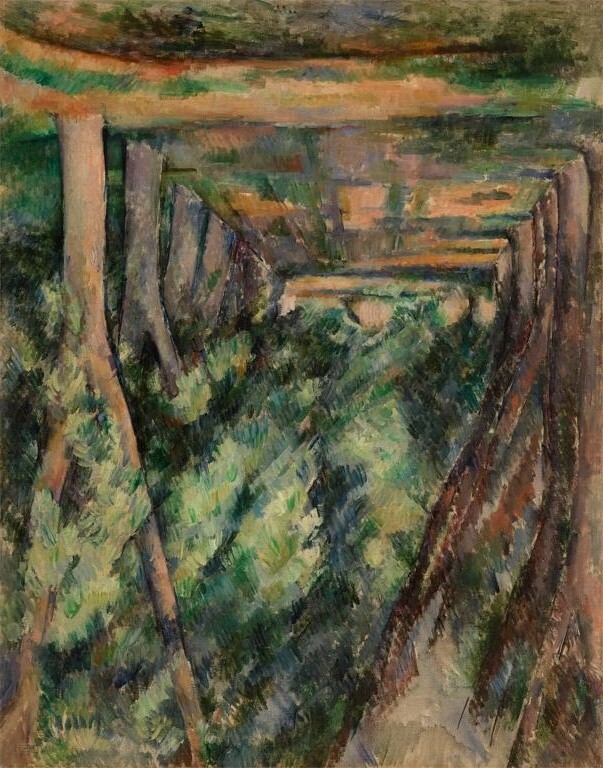 (1) “Cézanne was not only shortsighted . . . but, as a diabetic, probably had some retinal damage too,” said critic Brian Sewell, to explain Cézanne’s spatial distortions; (2) “the real appeal of this mini blockbuster is its modest vision of a rural pastime, rendered with infinite patience,” said Karen Rosenberg, the New York Times critic; (3) “Paint concentrates fetishistically on details of their appearance. A bowler hat becomes glaringly phallic, so does a pipe. In one portrait, a man sits passively, and you notice that his crotch is a black valley of shadow,” said Jonathan Jones in the Guardian. There’s an APP to remedy this lack of aesthetic information. I call it the Aesthetic Perception Process. You have been learning how to use this APP by reading and trying out the exercises in these posts. For instance, if you examine the following painting, what do you see? 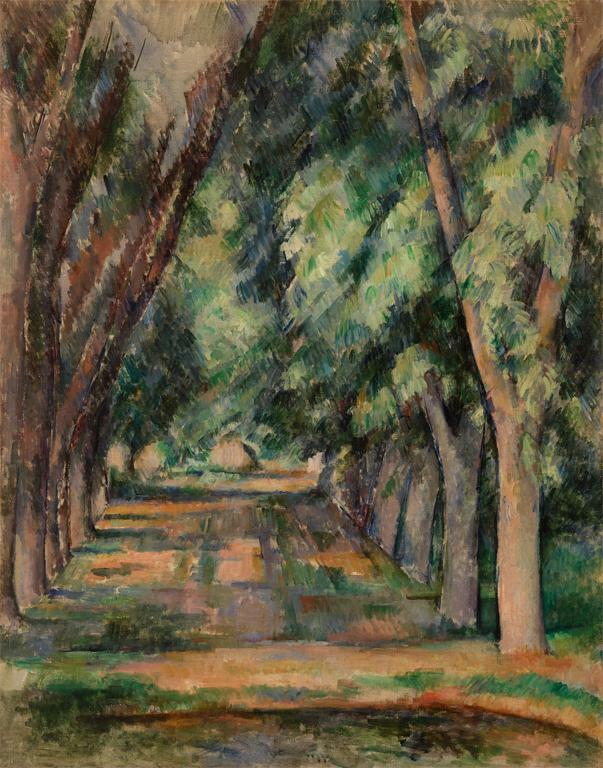 Cézanne transformed the “real” world of a path between two lines of trees into a CSI (a color scene investigation). He invented new subject matter, orchestrated relationships among his means (light, line, color, space), and painted the picture. To appreciate this work of art, we come into this equation at the end: at the picture. We study the picture, describe the relationships, see what new matter the artist created, and state the intent: the picture idea. When we reach this point, we understand the visual aesthetic experience that transformed Cézanne’s “real” world into a CSI (a color scene investigation). Now we can appreciate (enjoy via understanding) the art in the picture. We experience the picture aesthetically. If you feel rusty because you have not done this work recently, try this: look at the picture upside down. Think about your first reaction as you looked at this upside-down painting. 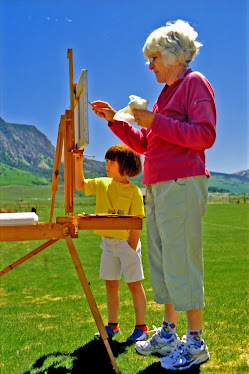 My mentor, Edward L. Loper, Sr., showed me this trick when, as a beginning painting student, I struggled to finish a painting. “Turn it upside down,” he commanded. Upside down, the subject loses its grip, and the plastic structure of the picture becomes apparent, its substance, as John Dewey calls it. The subject is seductive, as you have all discovered, and it can block you from appreciating the color clues. You can’t try this in a museum, but you can do it with a print or digital image or a painting you own. Upside down, a key feature of this painting appears—that deep space created by the clothespin-like bands closing off the space recession on the left and the right. Like thick, muscular, sinewy tentacles of an octopus, the tree branches force the eye into the pie-shaped wedge of space between them. The foliage, transformed into slanted, irregular volumes, step back into that space. Once into the deepest recess, marked by the small ochre semi-circle, strips of orange, ochre, and green build a platform beneath the final color unit of upright horizontal bands of terracotta red and gold. Notice how the inverted tree on the right, like a rigid tuning fork, stands out because of its lighter pink-tan color and connects with the curve of that glowing rolling band of emerald green, terracotta red, and ochre strips. 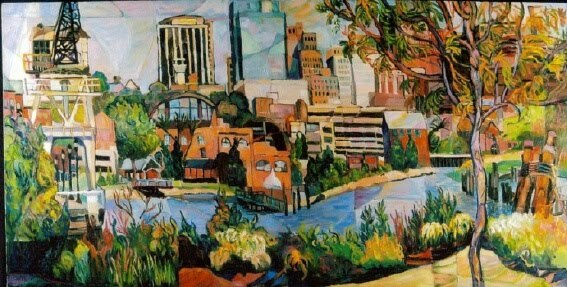 Right side up, the picture takes form: the foreground now becomes a step in and up to the tree on the right. From there, notice the inverted ˄’s between the tree trunks that morph into V’s as the branches rise. A clue. Where else do you see those V’s? What effect do they produce? 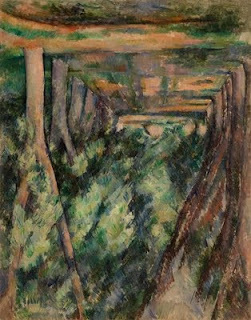 This dynamic relation of planes and solid color volumes in deep space, Dr. Barnes argues, is the principal theme of Cézanne’s paintings. Solidity, weight, equilibrium, balance—all revealed within a simple subject of a road winding through trees. Keep looking. 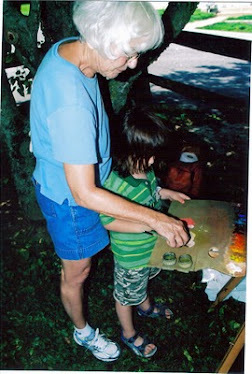 I know you will find more and more color clues and feel yourself drawn into the experience of discovery. If you feel so moved, share your perceptions with us by commenting here or, if you prefer more privacy, send me an e-mail. In the next post, I will return to this painting by comparing it to Tree Lined Street, Wawaset, a painting by Edward L. Loper, Sr. I was really surprised by my reaction to the painting upside down. I hope you enjoy your new Iphone. I must be one of the remaining hold-outs. Have you heard of the brushes app that David Hockney has become addicted to? This is great, Marilyn. Keep it up. The upside down painting usually surprises people. 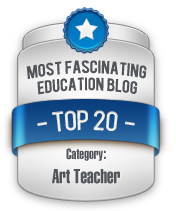 I suspect it has something to do with our "recognition" of the subject, generally the first response we have when we see a picture. When we must confront the orchestration of color shapes in space, we are aided by the tools I describe in these posts.